I have long been a fan of Chilton County peaches but it was only when I moved back to Alabama in 1999 that I became something of a snob about them. The local crop is becoming better known and any traveler on I-65 between Birmingham and Montgomery is bombarded by the billboards promoting the tourist-driven peach shops at exits around Clanton. The biggest billboard of all for Chilton County peaches is the giant peach water tower at exit 212 in Clanton. The giant peach water tower in Gaffney, South Carolina, is older and bigger but each makes its point with kitschy panache. To truly get a feel for Chilton County peaches, however, you must wander off the interstate and experience the numerous peach stands along Highway 82. When I lived in Montgomery from 1999 to 2002 I frequently traveled U.S. Highway 82 on the way to Tuscaloosa, where my parents lived at the time. Outside Montgomery, traveling northwest on 82, after going past the Robert Trent Jones Golf Trail resort and subdivisions in the town of Prattville, the highway turns aggressively two-lane and rural through Autauga, Chilton, and Bibb counties on the way to Tuscaloosa. As soon as you pass into Chilton County, from either direction, the roadside stands begin to appear. Some vendors come and go and others have been there for years. 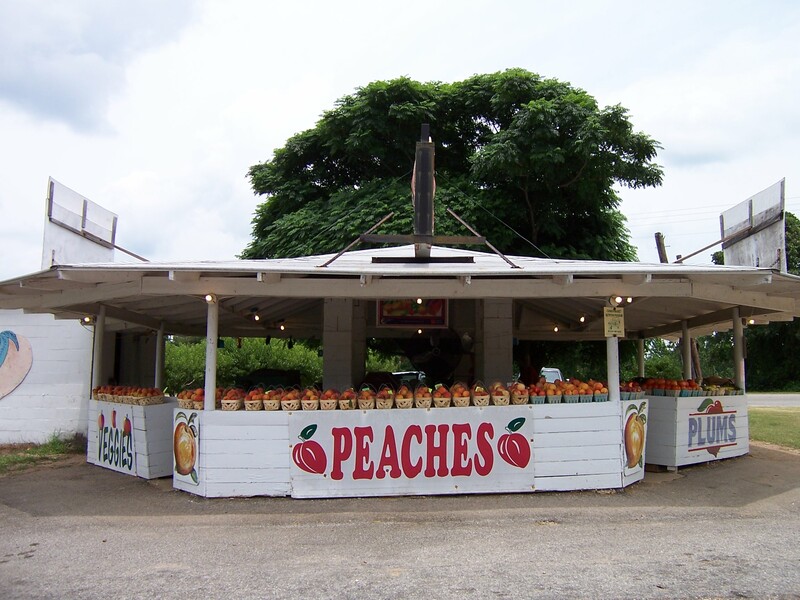 Sometime around Mother’s Day the stands, which have stood vacant during the cooler months, put up their freshly painted signs and the first succulent peaches of the year make their debut, lined up in full farm baskets and beckoning to all travelers. It is almost impossible not to stop. That moment – when I catch sight of my first peach stand of the season open for business with that sensual peach color and aroma – has become one of the defining moments of the growing season. My heart soars; I have been known to shout. After sampling most of the stands, one has become my clear favorite – not just for consistent quality but for sheer “ambience,” if that word applies for a humble fruit stand on a lonely stretch of rural highway (and I think it’s the perfect word). Jimmie’s is my hands-down favorite peach stand in Chilton County. Jimmie’s is located at a fork at the top of a hill where County Road 15 feeds into Highway 82. It’s a simple open wooden structure with display space on two sides facing each road. Baskets of peaches are lined up across the shelves facing Highway 82 and whatever other produce is in season is usually displayed on the other side. If you happen to get to Jimmie’s after hours, and if anything was left when they closed up for the night, there’s an honor box so you can buy what you need, leave the money in the box, and be on your way. Honor boxes. You don’t see them much anymore but every time I encounter one it strikes me as one of the most civilized and hopeful things left in the world. This entry was posted in food, the south and tagged Alabama, Chilton County, peaches on September 12, 2014 by gedwardjourney.